Bromelia ( Bro-kin-ee-yah ) are large, thorny pinwheels of leaves that are intensely colorful in flower. The leaves are sword-like, razor sharp and form a protective barrier that animals ( or gardeners ) will not cross. The genus is named after the Swedish doctor and botanist Olof Bromelius. Bromelia are common in Latin America and the West Indies. Botanical Archetype – PACIFICATION, Pleasure. Nature of Issue – PROVOCATION, Irritation due to Attack or Threat, Inflammation. Attacked, bruised or suffering from rough handling. Provoked into an agressive or defensive posture. Remaining in that stance as your approach to life. Excessive inner / spiritual work that provokes a negative response because of the constant criticism of the soul. Primary Emotion / Emotional Symptom – INFLAME / INTENSE / ‘SORE’. + Pacify, Smooth Transition, Seamless Change, Gradual Shift, Careful, Gentle, Sooth, Relieve, Ease, Please. – Harsh, Rough, Bruised, Barbaric, Tender, Sore, Provoked, Attacked, Inflame, Irritation, Enrage, Outrage, Boiling Point. Lesson – Leave your soul alone. Your spirit will emerge in its own time, in its own way. Bromelia help ease ‘sore points’ in the mind or body. Bromelia helps to reduce ‘swelling’ from emotional sore points that are repeatedly harassed or triggered. Bromelia helps to protect you from yourself if you are a ‘heavy-handed healer’. A person who (a) throws every health technique known to man at (b) their problems (c) which results in your soul being bombarded by things it may not need. (d) Driven by a faulty self image and a sick mentality. 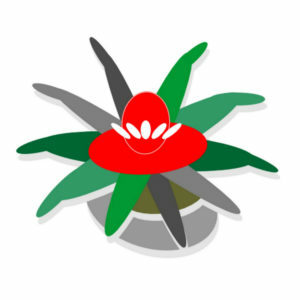 This is the botanical symbol for genus Bromelia. It is found in all of our books, clinical manuals, flower notes and charts.